Asil Foundation - A non-profit organization, headquartered in Istanbul, which contributes to the development of the youth through quality education, research and community services. Economic Development Foundation (IKV) - A national civil society organization established on the initiative of Istanbul Chamber of Commerce and Istanbul Chamber of Industry in 1965, to inform the Turkish business world and the public about developments in the EU and Turkey-EU relations. Education Reform Initiative (ERG) - ERG is an independent and not-for-profit think-and-do-tank that contributes to systemic transformation in education for development of the child and society through sound evidence, constructive dialogue and innovative/critical thinking. Foundation for the Support of Women’s Work (KEDV) - The Foundation for the Support of Women’s Work was founded as a non-profit civil society organization in 1986 with the aim to empower women to change their lives and their communities, and to build resilient communities free from poverty and inequality. Human Resource Development Foundation (IKGV) - Human Resource Development Foundation is a leading non-profit, non-governmental and autonomous organization in Turkey. The mission of the Foundation is to perform any and all activities in order to contribute to the solution of health, education and employment problems which have a negative impact on the economic, social and cultural development of human resource. Network for Refugee Voices (NRV) - NRV is a group of refugee and refugee-led organisations working to contribute to processes and commitments aimed at reforming the international refugee protection regime, including the UN Global Compact on Refugees and Compact for Migration. Oxfam - Oxfam is an international confederation of 20 organizations working together with partners and local communities in more than 90 countries. Oxfam is driven by a vision of a just world without poverty. Ravda Nur Association - Ravdanur Association is an independent philanthropic and advocacy association that aims to improve living standards of refugees, asylum seekers and displaced people in Turkey and those who suffered during the war, focusing on young children, boys and girl’s education, health and protection. Support to Life (Hayata Destek) - An independent humanitarian organization founded with the principle aim of helping disaster affected communities meet their basic needs and rights. The Research Center for Asylum and Migration (IGAM) - IGAM was founded as a non-profit organizations on 12 June 2013 in Ankara by a group of academics, researchers, journalists and humanitarian workers to fill the gap of nonexistence of an independent research center on asylum and migration issues. 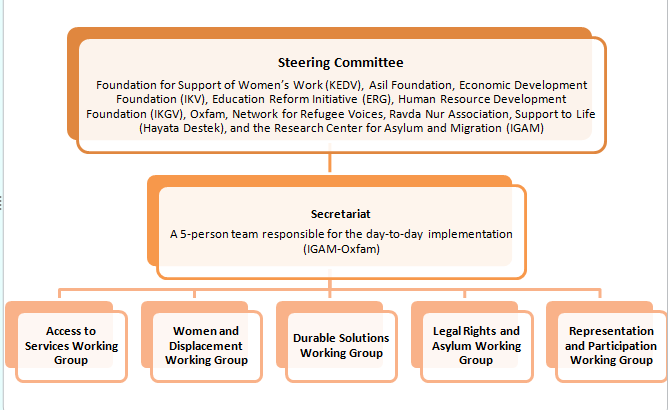 A small secretariat, jointly hosted by IGAM and Oxfam, has been responsible for the implementation of the day-to-day work of the process, under the guidance of the Steering Committee.